In a recent post I wrote about the stress of urban living and blaming a lot of that on the sometimes inhumanely crowded stations and trains. Well, as crazy as it gets sometimes I’ve gotten to know the Tokyo train and subway system pretty well now and I’ve accumulated quite a few strategies and tips. The rails around Tokyo can be separated into three sections. 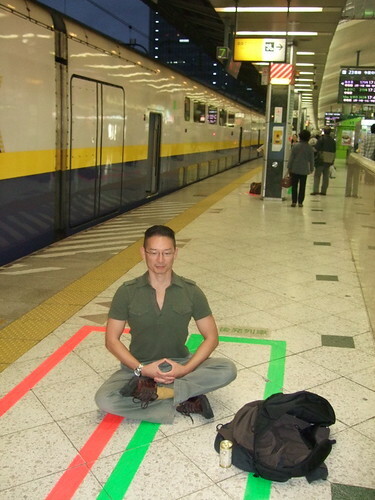 It’s best to orient yourself from the Yamanote Line that circles around central Tokyo. On maps, it’s a green circle. In real-life, it’s shaped like an upside down pear. Conceptually I like to think of it as a square with four major stations as its corners, kind of like a castle wall with four corner gates. On the west, the wall stretches from Ikebukuro in the northwest corner down to Shibuya in the southeast. This is by far the busiest length with Shinjuku, the busiest station in the world, in the middle as the west gate. The north wall stretches from Ikebukuro to Ueno. 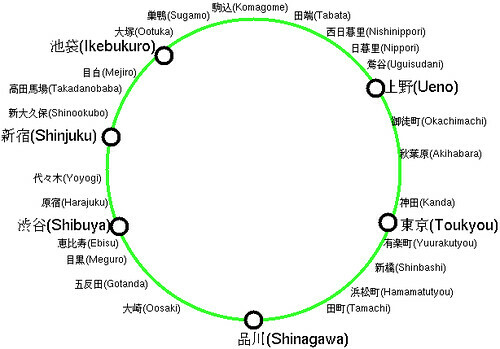 The west leg is a short jaunt between Ueno and Tokyo stations, and in the south it’s Tokyo to Shibuya, with Shinagawa in the middle as the south gate. Enclosed in the Yamanote are the subway lines that zig-zag about like a gopher colony. Radiating out from the Yamanote are the private train lines that feed Tokyo all the suburban commuters that double the city’s population during work hours. Get a pass. The public transportation system offers two passes, called the Suica or the Pasmo, that you can use on all trains, subways, and even buses. You add credit to it and just zip through turnstiles by hovering the pass over the electronic sensor. You can even use it at restaurants and shops in the stations. It’s brilliant and convenient. However, if you harbor any paranoia about the government tracking you, you can always just register it under a false name. Or tediously pay for each ticket every time you hop on. Know your exit strategy. If you are a daily commuter, try to get in the train car that directly empties into your exit. This is the difference between being jostled by a slow-moving crowd to just zipping out of a station unimpeded. Also, know which side will open at your stop. Sometimes I wait for everyone to get in before standing right in front of the door, poised to surf ahead of the wave of people. Slip through the cracks. In American football, the running back is the player that runs with the ball through the defense. The most successful are ones who can anticipate seams in the wall of people and slip between them. This makes it a game and makes it more fun than just slugglishly shuffling with the crowd. Go with the flow. Get into the stream of people going in your direction. Otherwise, wading upstream is both a nuisance to yourself and all the other people going the opposite way. Be aerodynamic. In bicycling, one strategy is to ride behind someone to cut down on wind-resistance and conserve energy. It takes a lot of energy to get through a crowd. So whenever you see a big person successfully plowing through a crowd, get behind that person and ride his or her wake. Let them do all the work. This is good for the surrounding people too because it’s one less person getting in their way. Don’t block the flow. If you need to use your phone, or stop and figure out which way to go, get out of the stream of people. Stand against a wall or beside a pillar and get yourself sorted. Take a stand. When using escalators, it’s customary to stand on the left, and walk on the right. I hear it’s the reverse in Osaka. So now you’re inside the train or subway. Where do you stand? If it’s not that crowded, anywhere is fine. I like to stand beside the doors because I can lean on two sides, and I’m poised for a quick escape. I generally avoid sitting because I often end up with two people falling asleep on my shoulders, while having to stare at some guy’s crotch standing in front of me. In a crowded train, the best place is to be that guy standing in front of the seats. Because the people in front of you are seated, you have some empty space around your head. In general you won’t run into many problems on the train. It’s surprising how well-behaved everyone is on the trains and subways in Tokyo. No one eats. No one talks on the cell phone, except in brief hushed tones with the mouth covered. There’s no litter, not even newspapers. And except on weekends, no one really speaks loudly. There’s some controversy about young women applying make-up in public, but geez, why is that a big deal? Of course, groping is frowned upon. There’s been greater awareness about sexual harassment on the trains. So I’ve noticed guys generally try to face away from women and keep their hands up in a visible place. I don’t know how prevalent a problem it is but I do know that under similar crowd conditions, it’d be a lot worse in the US or Europe. During rush hour there are separate women-only cars, which was begun just a few years ago. So that helps. It seems most kinds of behavior are looked down upon. What seems to be acceptable is: sleeping, listening to your music player, playing handheld video games, sending texts on your cell phone, reading small books with anonymous dust jackets, and most acceptable of all, doing nothing. Or maybe it’s just meditation.